"3LA1, V-1968" by Timothy K. Perttula and Robert Z. Selden Jr.
DECORATION: The upper rim panel is plain. The lower rim panel has opposed sets of diagonal engraved lines and hatched triangles. 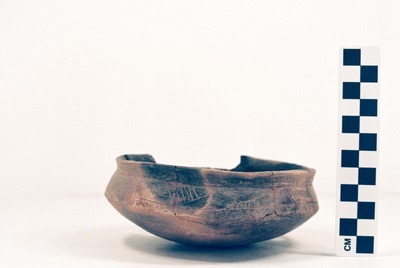 Simms Engraved carinated bowl (5425-630).